DESCRIPTION: One-component brush-on ~55% Zinc Epoxy primer for steel and rebar. Zinc Rich Primer (~55% zinc) is a one component epoxy super-primer designed to prime and protect reinforcing steel or steel panels in difficult environments. 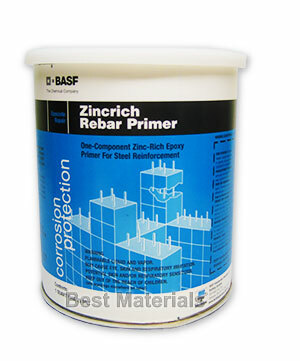 Zincrich Rebar Primer combats corrosion through electro-chemical means by preventing anode transfer. • Quick Drying: Dries to touch in 15-45 minutes. • Compatible with all repair mortars. • Good pot life allow ample time for application.